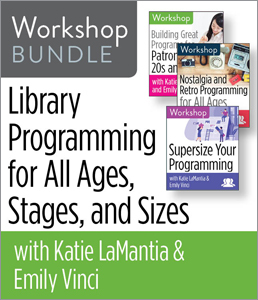 CHICAGO—ALA Publishing eLearning Solutions announces an exciting new workshop bundle, Library Programming for All Ages, Stages, and Sizes with Katie LaMantia & Emily Vinci. This workshop bundle consists of three 90-minute workshops and takes place on Mondays, May 6, 13, and 20, 2019, 2:30pm Eastern/1:30 Central/12:30 Mountain/11:30am Pacific each workshop. When it comes to library programs, there’s no one-size-fits-all guide. Your programming should match the needs of your community, which vary considerably. Whether you need some new ideas, are looking to appeal to different populations, or want to grow your programs, if you work on library programs, this workshop bundle is for you! In these three 90-minute events, library programming experts Emily Vinci and Katie LaMantia guide you through a wide variety of program examples, techniques, skills, and insights that will give your programming a boost! Learn how to how to engage with patrons of all ages and bring dynamic programs from the past back into the library with flair. Vinci and LaMantia break down the key ingredients in pulling off a library take-over and show you how to create a workable template for putting on your own large-scale library program. Learn strategies and gain resources for reaching the 20s and 30s demographic. You can purchase registration for these workshops separately or as a bundle. Katie LaMantia is a collection development librarian at Baker and Taylor. She previously worked as a teen librarian at the Schaumburg Township District Library in Schaumburg, Illinois and is a former Teen Advisory Board member turned librarian. She is the co-author of the books Pop Culture-Inspired Programs for Tweens, Teens, and Adults (ALA Editions, 2018), 50+ Fandom Programs: Planning Festivals and Events for Tweens, Teens, and Adults (ALA Editions, 2017) and A Year of Programs for Millennials and More (ALA Editions, 2015). She has a personal and professional appreciation and interest in pop culture and has presented at multiple state and national library conferences about libraries, teens, and 20s and 30s programming. In her spare time she enjoys traveling, reading, writing, and extreme adventure activities. Emily Vinci is the fiction manager at the Schaumburg Township District Library in Schaumburg, Illinois. Her professional interests are promoting the acquisition and appreciation of comics and graphic novels in libraries as well as creating programming that targets patrons in their 20s and 30s. She presents frequently about pop culture and niche library programming and coauthored the books A Year of Programs for Millennials and More (ALA Editions, 2015), 50+ Fandom Programs (ALA Editions, 2017), and Pop Culture-Inspired Programs for Tweens, Teens, and Adults (ALA Editions, 2018). A lifelong lover of all things pop culture and an avid collector, currently has more than two hundred copies of the Jurassic Park films on VHS and is always looking for more. Registration for this ALA Publishing eLearning Solutions Workshop Bundle is available on the ALA Store. You can purchase registration at both individual and group rates.